Heinz Nacke was born on 22 December 1909 at Ullendorf in the Meissen region of Sachsen. Nacke flew as a reconnaisance pilot in the Condor Legion during the Spanish Civil War. He was awarded the Spanienkreuz in Gold mit Schwerten for his accomplishments in that conflict. On 1 July 1939, Nacke was appointed Staffelkapitän of 6./ZG 76 flying Bf 110 Zerstörer twin-engine fighters. He operated during the Battle of France and gained his initial success on 12 May 1940, when he shot down a French Morane fighter. He added a further eight victories during the French campaign. Nacke participated in the Battle of Britain with considerable success. He claimed two RAF Hurricane fighters shot down on 15 August 1940 to record his 10th and 11th victories. On 30 August 1940, Nacke claimed three RAF Hurricane fighters shot down (12-14). He was awarded the Ritterkreuz on 2 November 1940 for 12 victories. From 12 April to 14 August 1941, Nacke commanded the Erprobungsstaffel 210. On 14 August 1941, Major Nacke was appointed Gruppenkommandeur of II./ZG 76. When II./ZG 76 was absorbed into the Nachtjagd, Nacke remained Gruppenkommandeur of III./NJG 3. He led the unit until 21 April 1943. On 22 April 1943, Major Nacke was appointed Gruppenkommandeur of Erprobungskommando 25 testing heavy weapons and other special weapons against USAAF bombers. Nacke was appointed Gruppenkommandeur of II./ZG 1, based at Montecourvino in Italy, on 26 May 1943. He added no further victories to his tally while serving with the Gruppe. On 2 August 1943, Nacke was seriously injured in the crash-landing of Bf 110 G-2 (W.Nr. 6303) “S9 + KM” during a delivery flight. The injuries were so serious he was forced to relinquish command of II./ZG 1. 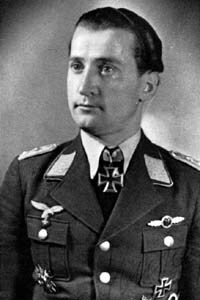 On 15 January 1944, Oberst Nacke was appointed Kommodore of ZG 101. He retained the position until the end of the war. Nacke died on 16 September 1984 in Stuttgart. Heinz Nacke was credited with 14 victories. All his victories were recorded over the Western front.